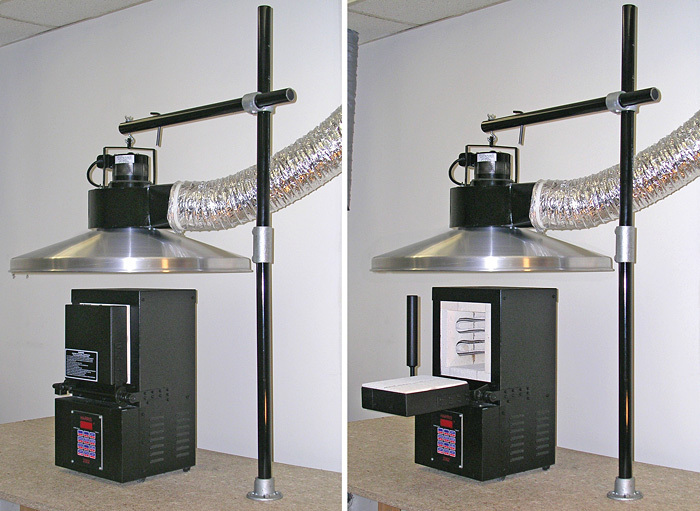 Vent-A-Kiln/Vent-A-Fume table-mounted units are complete ventilation systems typically used in dental labs (or other industries that have burnout ovens), and with jewelry and glassmaking kilns or small ceramic kilns. These models are appropriate for almost any application that requires tabletop ventilation of process emissions. Designed for the professional and hobbyist alike, Vent-A-Kiln/Vent-A-Fume table-mounted ventilation systems are easy to assemble and provide an ergonomic solution to creating and maintaining a healthier work environment for you and your associates. The close-capture design allows for quick and efficient removal of virtually all unwanted fumes and odors as well as excess heat. As an adjustable-height, positive-pressure system, Vent-A-Kiln/Vent-A-Fume exhausts process emissions to the outside or into your existing duct-work.